Paolo Sabbatini received his PhD (2002) and MS (1997) in Horticulture from the University of Ancona (Italy). From 2002, he worked as post-doc focusing his research on carbon assimilation and in 2004 moved to Michigan State for continuing his post-doctoral studies on natural carbon isotope discrimination and source-sink relationship. 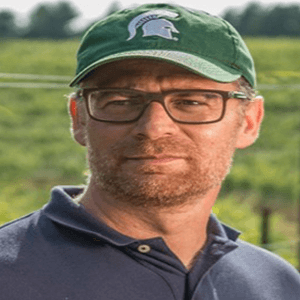 In 2007 he joined the Department of Horticulture of the Michigan State University as Assistant Professor in viticulture with research (50%), extension (40%) and teaching (10%) responsibilities and he become Associate Professor in 2013. Research focus is on vine physiology of juice and wine grapes. Emphasis is on physiological and cultural factors limiting vine growth, sustainable yield, fruit quality and their interaction with biotic and abiotic stress. His ultimate goal is to solve whole plant problems that will optimize vine productivity and quality. He has State responsibilities for evaluation of wine cultivar and several ongoing research projects funded by MGWIC (Michigan Grape Wine and industry Council), Welch’s National Grape Cooperative, Project GREEEN (MSU AgBioResearch) and USDA on vine balance, canopy management, determination of action thresholds of pest and diseases and viticultural approaches to reduce bunch rot in wine grapes. He is affiliated with several professional societies; ASEV (from 2007), ASEV-ES (from 2009), ISHS (from 2002) and ASHS (from 2006). His research focus is on vine physiology of juice and wine grapes. Emphasis is on physiological and cultural factors limiting vine growth, sustainable yield, fruit quality and their interaction with biotic and abiotic stress. His research goals is to solve whole plant problems that will optimize vine productivity and quality. Research activities focus on vine physiology under Michigan cool climate conditions. The main objective is identifying environmental, physiological and cultural factors that limit vine growth and development, fruit maturity and quality. In particular a) photosynthetic carbon assimilation and partitioning, b) effect of biotic and abiotic stress on vine yield and fruit quality, and c) natural carbon isotope discrimination. Canopy management, crop estimation and adjustment and vineyard mechanization are primary focus to better control cultural and physiological factors important for efficient production of high-value grapes.